Posted on April 23, 2015 by KELLY GREENE	• This entry was posted in Preachers of Detroit and tagged Bishop Corletta Vaughn, Hilary Clinton, Pastor Don Shelby Jr, Preachers of Detroit. Bookmark the permalink. Thanks for speaking your heart.. I heard you and I hear you. Ms. Greene I pray that we have not been misunderstood. I have been married for 28 years to the lovely Bonita Shelby and we have honored God in our marriage and home. First of all I support women in ministry. I have female ministers in my church and some of my closest friends are female pastors. Secondly, when I said,”I wouldn’t marry a bishop, I’ll marry a women” the previous episode shows the meaning of that statement, which was that I do not marry titles, Bishop, pastor, senator etc, I don’t think we should marry based on position or things . Remember the editors will cut a statement to make it fit for TV. Then lastly, my wife and Corletta spoke for over 2 hours. And that scene was only 3 minutes and based on what was aired neither women made not one point nor was any of their dialogue, views or positions aired. Again, it was made for TV. We love Bishop Vaughn and Gil.. Don’t make us enemies by creating or reading into something falsely. I support her ministry and do not stand in the way of her progress or any women in the Kingdom who has a call on their life. None of us will have to stand before men but on the day of judgement we will all stand before God to give an account of the deeds we’ve done.. So therefore, all ministers male and female must answer to God and He will judge all things. I pray for your continued success as a voice in the kingdom. Thank you for reading my piece Pastor!! I totally understand your view. I have been following this journey you and the cast have been on in hopes of not only introducing the leaders of faith in our city to my readers, but also get people to see a part of themselves as well. I raised some questions in this piece that I intend on answering in the next. I admire your commitment to traditionalism however there is a change in our country that must take place to better us as a whole in regards to women. It is men and women who live as you and your wife do who will have the toughest time. I will say this. We will also need your guidance in regards to keeping a marriage grounded. Divorce rates are at an all time high. Your experience and wisdom can help us all keep this number down. I hope to meet you one day and thank you for the way you not only represented the faith but our city as well! May God continue to bless and keep you and your family! I realize that this short clip of the conversation between Bishop Vaughn and Mrs. Shelby cut out a lot of their conversation. But, I have to disagree with you, Mr. Greene. I thought it was Bishop Vaughn who was being defensive and defiant – and a bit hypocritical. She claims to want to see strong women – but she only wants to see strong women who fit her image. Mrs. Shelby is a very strong woman and she demonstrated that by demanding that she be heard in the conversation and not letting Bishop Vaughn over power her. She stood her ground, as strong women do. That took Bishop Vaughn by surprise. And while Pastor and Mrs. Shelby might be traditionalists, we sometimes need tradition for that is our foundation. 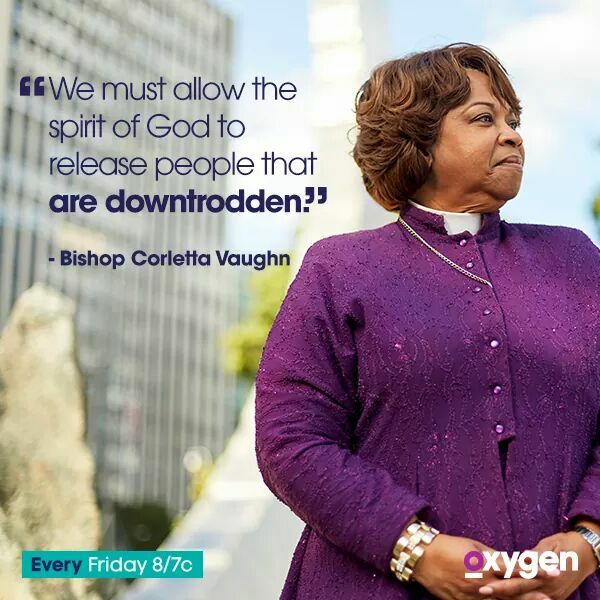 I agree with you that we also need women who are trailblazers, like Bishop Vaughn. This world needs both Bishop Vaughns and Mrs. Shelbys.